So, you’re ready to join the gig economy, but you aren’t ready to leave your full-time job. Well, take heart, because you aren’t alone. An Intuit study found that among all side-hustling Americans, 41 percent also have traditional part- or full-time jobs. 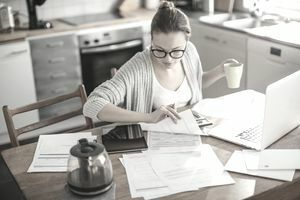 Side hustling in your spare time is a great way to supplement your income and even transition into business ownership, so it’s not surprising that it’s so common in today’s workforce. Still, many side-hustlers with full-time jobs share a common worry: What happens if your boss finds out? If you share that concern, take these steps to protect your full-time job while pursuing your personal ambitions. Employment contract: This agreement outlines the terms and conditions of your employment. Put simply, it states what you and your company can expect from one another. This includes your salary, the terms of your employment (i.e., full-time, part-time, contract, etc. ), the hours in a typical workweek, responsibilities, benefits, and yes, loyalty expectations. Many companies, especially start-ups, are wary of employees who split their focus with another job, regardless of whether you manage it in your free time. Comb the language to learn whether your boss has already taken a stance on this issue. Non-disclosure agreement: Companies have a right to protect their profitability, and a non-disclosure agreement prevents employees (past and present) from sharing sensitive information like trade secrets, business strategies, income reports, and other internal data. As a freelancer, benefitting from your inside knowledge is legally risky, and it’s wise to insulate your side gig from unethical business practices. Non-compete clauses: This contract protects your employer by limiting your ability to compete with them in the same industry after you leave the company, usually for a specified period of time. State laws often affect the enforceability of NCCs after you leave your job, but you’ll run into serious risks if your side hustle and current position share any common ground. Read the language carefully and consult an attorney if you need clarification. It’s no secret that employers monitor their staff’s online activity. While your boss may not mind a few wasted minutes on Facebook, running your business on company time is another story. Using your work computer to manage side hustle clients or run your e-commerce site is a big no, especially if you’re doing it at work. When you mix professional time, you run the risk of being found out via tech monitoring—or worse yet, by a boss looking over your shoulder. Be respectful of your company’s time and resources by taking your gig ambitions offsite and using your own tools to succeed. That means steering clear of the office supplies, printing services, software licenses, and even your workplace laptop. Using these resources is probably a clear violation of your employment contract, and even if it’s not, put yourself in your boss’s shoes and make the prudent choice. If you can’t avoid your side business during the day, take your personal computer to a coffee shop over lunch. That said, it’s also a good idea to lock down your business’s social media activity during work hours to avoid the appearance of misusing your time. We all make friends at work, and while you might be tempted to involve your coworkers in your personal business, think twice before acting. Your workplace peers signed the same legal contracts with your employer, and involving them would put both of your jobs in jeopardy. Just as you shouldn’t use company office supplies and resources, you also shouldn’t rely on Dave from accounting to set up Quickbooks for your side gig. There’s good news when it comes to keeping your pen out of the company ink: The gig economy has millions of other freelancers for you to connect with. Consider outsourcing your needs to fellow pros using Fiverr, TaskRabbit, or other gig job site. This strategy will help you establish connections, grow your side business, and avoid compromising your full-time job. Keeping a secret usually means living with stress, and hiding your side hustle might not be worth the mental anguish. Assuming you haven’t violated any company policies, your boss might be open to your freelancing ambitions. If you have a good working relationship, consider scheduling a meeting in the interest of transparency. Highlight the reasons you started a side business and make it clear that your role at the company comes first. If talking to your boss seems overwhelming, run your concerns past the HR department, highlighting your desire to respect company policies and behave honestly. Side hustling can a lucrative and fun way to enhance your life, and a few safeguards can help things run smoothly. Arrange your priorities and protect your full-time income along the way.